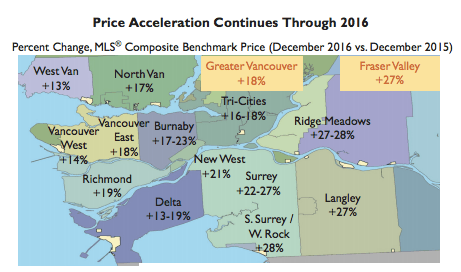 Today the boys over at CMHC (Canada Mortgage and Housing Corporation) released their first report of 2017 on the Vancouver real estate market. Full report here. 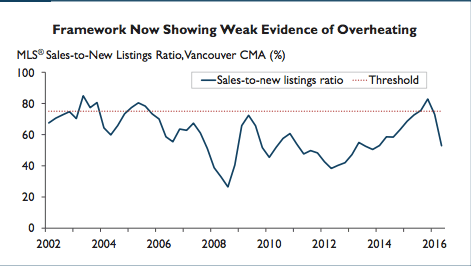 To little surprise, CMHC once again declared Vancouver as overvalued. However, in the process they also announced a cooling market and no signs of overbuilding. Let’s break it down. CMHC believes there is now weak evidence of overheating in the market. REBGV detached sales were down 52% year over year in December, townhouses 40% and condos 25% so really no shock there. Meanwhile, sales/new listings which is a key indicator of demand fell again for the second quarter. The general rule of thumb is a sales/new listings ratio above 75% puts upwards pressure on prices, while below 50% puts a downward pressure on prices. However, it’s important to note that this chart combines all three markets (detached, townhouse, condos). They are all performing differently. Much of the downfall is from the detached market. Again, they have combined all three markets which can be misleading. And although the yearly gains look astronomical those price gains have dropped in recent months. For consistency, here’s how the MLS Benchmark looks now. FVREB benchmark price all types. “home prices exceed levels supported by economic, demographic and financial fundamentals.” No kidding. Interestingly, sales of multi-family homes comprised 56% of all sales in the first six months of 2016, and rose to 68% in the second half. Overall, 19% of homes sold in the fourth quarter of 2016 were over $2 million compared to 21% in the same period a year earlier. A good indicator that condos and townhouses are now conducting the Vancouver gravy train. I find their argument is completely predicated on current demand levels being sustained. However, the continued slump in sales across all market segments clearly shows demand levels are falling. As per my post The Big Boom, housing starts in Metro Vancouver were 57% above the 10 year average in 2016. All in all a relatively sound overview from CMHC. It clearly highlights a changing of the guard in the market, and the importance of segmenting the market as they are all functioning differently. (I highlighted this in The Good The Bad and the Ugly). Like this post? Get my best work sent to your inbox here.